A Publishers Weekly Most Anticipated Young Adult Book of Spring 2017! 3.0 out of 5 starsThe worldbuilding is great, I love the world building and the descriptions are lovely. THE BONE WITCH is slow to start. The worldbuilding is great, I love the world building and the descriptions are lovely. However, not a lot happens and it drags for a while in the middle before finally getting to the plot in the last ten to fifteen percent of the book. There is so much world building; there's so much information on the cities, and the beliefs, and what each form of dress means to each person's role. But it's so much filler. I found myself skimming a lot of the time where Tea was preparing to become an apprentice and then learning to become an asha. I loved Tea learning the realities of being asha and finding out what could and couldn't be done with magic, but I preferred her learning it on the move with Mykaela rather than at House Valerian. The characters were probably the best part, but even then there didn't seem to be too much to them. Tea seems to pick up what she needs mostly through instinct, but it was nice to know that as she was learning time was passing—although at times it didn't seem like it—and she wasn't instantly proficient at everything. I liked her relationship with Fox, and I liked that despite both of them being close siblings they still hid things from each other and each tried to keep the other from harm. This book has girl hate. There are quite a few female characters, but many of the ones Tea's age are either mentioned in passing, rarely involved, or looked down on in some aspects. One of the rivalries seemingly gets resolved with no real interactions between the characters before the change; part of that could be excused as to how the asha system is set up with 'sisters', but I would have really liked to see the development within the book itself. I liked the parts between chapters where Tea was talking to the Bard, I liked seeing where she is now and where younger Tea is going to end up. Speaking of, I liked seeing potential hints as to how she ended up where she did within the numbered chapters. I can't wait to see what paths she chooses and how things develop. This book felt a lot like build up. There's a potential plot. There's a potential love triangle. There's a potential change coming. I felt like this book needed more, but the second one in the series may explore everything further. I just wish this one had more plot than it did, as it really felt like it was mostly filler. This is not to be missed. Book 1 of a trilogy - I downloaded the second one as soon as I finished & if it wasn't close to midnight I'd have already kept reading. Can't wait to get work out of the way tomorrow so I can keep reading. 4.0 out of 5 starsNecromancer meets Memoirs of a Geisha – 4.5 stars! Necromancer meets Memoirs of a Geisha – 4.5 stars! Tea is a witch like no other that’s been born into the eight kingdoms for decades; when her powers awakened, she unwittingly used her powers as a necromancer to resurrect her dead brother. As a new and rare Bone Witch, she must follow her path to become a fully fledged dark Asha wielding dark powers that could either save or destroy her world; powers that are misunderstood, feared and frowned upon. This book is amazing with creative world building mixed with lyrical, engaging story-telling. 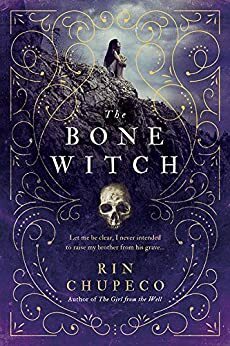 The Bone Witch has exceeded my expectations, it’s got an absorbing and interesting premise which is used to explore the themes of self-discovery, journey, politics and diversity. Tea’s apprenticeship to become a dark Asha is akin to that of the Memoirs of Geisha, very interesting! Book 1 sets up well for the sequel which I just can’t wait to read! I also enjoyed how the story was told using foreshadowing, like a story within a story through alternating perspectives. It is very well written and highly recommended read for readers who enjoys a YA fantasy story somewhat similar to Memoirs of a Geisha but with magic, the walking dead, monsters, potions, magical dresses, spells, prophecies, necromancing and amazing world building.